Tonight we were lucky enough to have dinner guests. Paul and Caolan were, like many before them, kind enough to come and visit us being that Jen is on bed rest. It's nice having friends come visit us. That way they are able to observe us from a distance as though we were a pair of mating pandas who had been penned together at the zoo. It is for this reason that the babies will be named Lan Lan and Tong Tong. 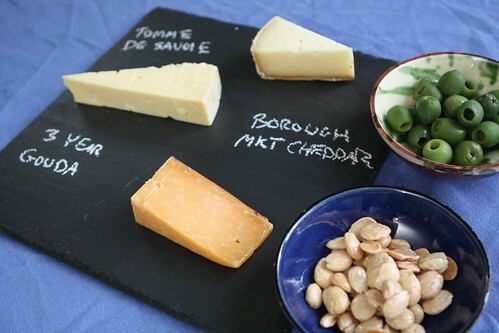 I started out by putting out this cheese place with clothbound Borough Market cheddar, three year aged Gouda, and Tomme de Savoie. I heard once that cheese plates are supposed to have a theme so the theme for this plate was cheeses you may find somewhere in Europe. 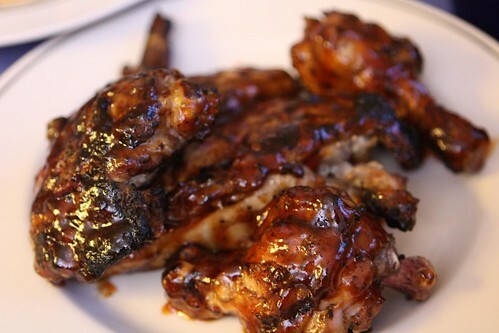 I grilled up some chicken and tossed it with a good amount of barbecue sauce. Since it was not pouring rain I did by best to make the most of the potential girilling weather. 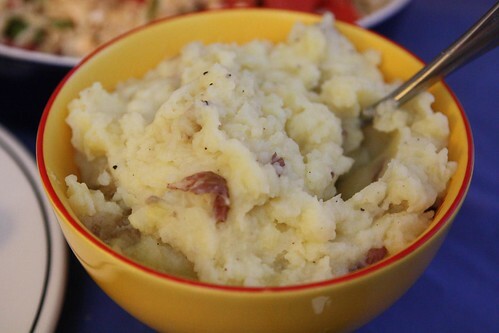 For an accompaniment I made some simple mashed potatoes. 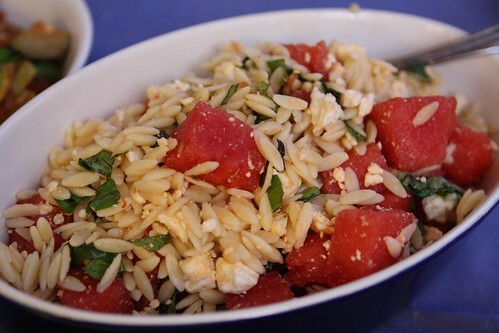 Caolan brought over a salad made with watermelon, orzo, mint, and feta. It was quite good, and, was the first dish we've had which doubled as an acid reflux remedy for Jen. 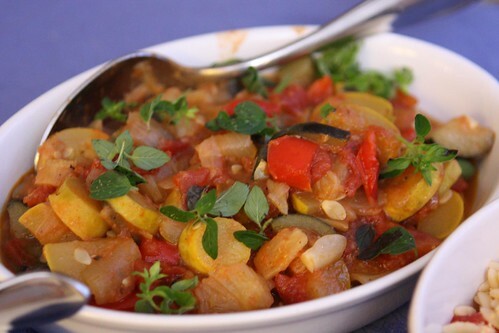 With the farm squash I stewed it down with browned garlic, onion, fennel, red pepper, tomato, and oregano. Having dinner guests was the perfect opportunity to use up as much vegetables as possible. 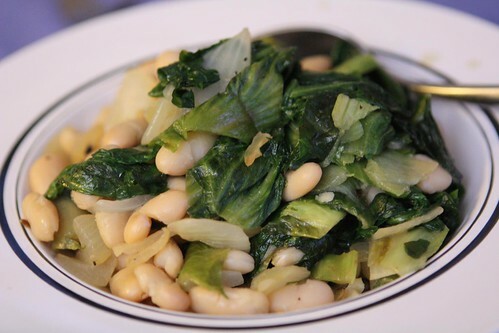 I also made this Escarole dish with browned garlic, onion, and cannellini beans. 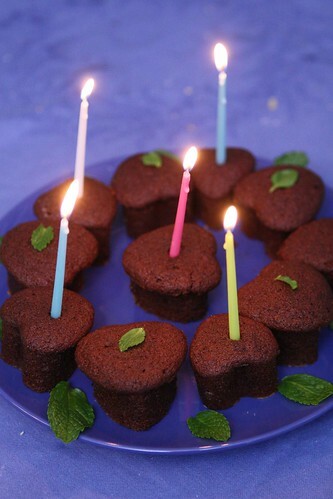 Since Jen's birthday is tomorrow Caolan was kind enough to bake some gingerbread cupcakes and bring them out with candles as we welcomed Jen back to the room. We didn't sing "Happy Birthday" as we were quite engrossed in watching the 1991 Ozzy Osbourne documentary: Don't Blame Me. 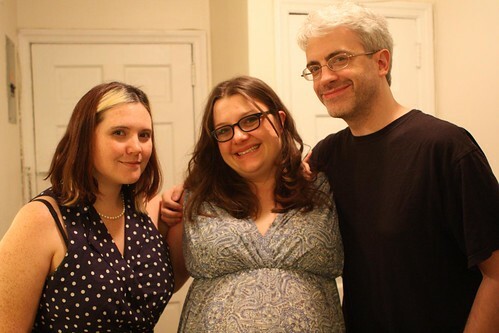 We learned a lot tonight about pot luck dinners, friendship, and Ozzy Osbourne. As Jen ages another year it's important to know about all of these things as we grow older. When she reaches my age I hope she has as much wisdom as I do about such matters. A friends a friend who knows what being a friend is, talking with a friend. Friends in life are special do you want me as your special friend?